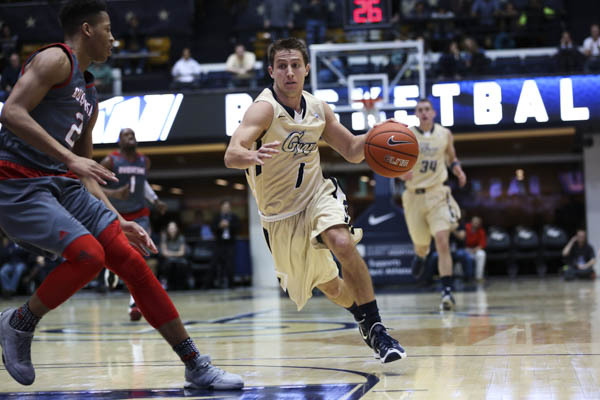 Media Credit: Graduate student guard Alex Mitola is averaging 9 points in 17.8 minutes off the bench in Atlantic 10 play this season. What a difference a month (or two) makes. With the first few games of the Atlantic 10 season in the books, here’s a look at the conference’s top competition for men’s basketball and what those teams revealed about themselves during non-conference play. So, this is awkward. We may have picked Dayton a bit low in our preseason rankings. It was a gut feeling. Since then the Flyers have picked up wins against No. 16 Iowa and Vanderbilt, James Madison transfer guard Charles Cooke has put together a phenomenal start to the season (15.7 points per game on 46.5 percent shooting, 43.5 percent on three-point attempts, 6.5 rebounds per game) and Dyshawn Pierre has returned. Freshman center Steve McElvene is averaging 7.1 rebounds and 2.1 blocks in 20.9 minutes per game. How do they serve crow in Ohio? Best win: Nov. 26, 82‒77 over Iowa in the AdvoCare Invitational. Worst loss: Jan. 9, 61‒57 to La Salle on the road. No Shaka, no problem, apparently. Will Wade’s Rams have the 23rd-most efficient defense in Division I, according to KenPom, and both the third-highest turnover percentage and second-best steals rate. VCU leads the A-10 in steals (10.4 per game) and turnover margin (+6.1) and, yes, your taxes are still due on the 15th of April. Senior guard Melvin Johnson leads the offense with 18.5 points per game, and Mo Alie-Cox is making contributions all over the stat sheet while demanding plenty of attention. Best win: Jan. 5, 85‒82 at Saint Joseph’s. Worst loss: Cheating here. Starting guard Jordan Burgess broke a finger on his nonshooting hand in VCU’s win at Saint Joseph’s and will be out a few weeks, Wade has said. The Colonials play the Rams on Feb. 6. That’s worse than a 74‒73 neutral court loss to Wisconsin on Nov. 22. Saint Joseph’s and VCU are similar in the sense that they don’t have any big upset wins, but also haven’t made any big missteps so far this season. The Hawks’ profile has risen largely because senior forward Isaiah Miles has taken advantage of opposing teams’ focus on DeAndre Bembry, averaging 18.3 points and 8.4 rebounds per game. That gives Saint Joseph’s one of the best frontcourts in the league. Bembry, who has to work for every bucket, is still averaging 16.7 points and 7.9 rebounds per game. The Hawks lead the A-10 in field goal percent defense and are second in rebounds. Best win: Jan. 2, 77‒73 at Richmond. Worst loss: Tie between the VCU game and a Nov. 21, 74‒63 loss to Florida on a neutral court, neither of which qualifies as a bad loss. Frankly, only beating Drexel by a point at home (Nov. 13, 82‒81) might be worse. This was supposed to be Rhode Island’s year, but a torn ACL ended E.C. Matthews’ season and put a damper on Rhode Island’s. The Rams have lost to Nebraska and Old Dominion and needed overtime to beat Iona and Brown. Rhode Island does lead the league in scoring defense, allowing just 64.6 points per game, and five players are averaging double-figures in scoring in Dan Hurley’s balanced offense. Best win: Jan. 5, 77‒65 over Richmond at home. Worst loss: Dec. 13, 70‒67 at Nebraska. Richmond (10-6, 2-2 A-10): The Spiders score 79.1 points per game and have beaten Cal and Northern Iowa, but they allow 72.8 points per game to opponents. Senior forward Terry Allen is scoring 20.1 points per game and adding 8.4 rebounds. He’s getting help with the scoring, but not with the rebounding. Davidson (10-5, 2-2 A-10): Not to be outdone by Richmond, Davidson has the best-scoring offense in the A-10 (81.1 points per game) and the worst-scoring defense (79.6 points allowed per game). The Wildcats only have losses to good teams – North Carolina, Pittsburgh, Cal and St. Bonaventure – and have not lost at home, but those Ls came by an average of 24 points. Along with making lots of threes, Davidson also turns the ball over on only 12 percent of possessions, the best in the nation according to KenPom. St. Bonaventure (12-3, 4-0 A-10): The Bonnies have surprised so far, with their best wins coming against Davidson and Rhode Island at home. They did play a rather soft non-conference schedule and had losses at Syracuse, Siena and at home to Hofstra. Other coaches do love to talk about the quiet smarts of St. Bonaventure skipper Mark Schmidt, and the Bonnies are in the upper half of the league in almost every statistical category, save for defensive rebounding.